So, I’ve blogged about making little chibi houses and chibi igloos for your gaming needs, but there’s another option: chibi cottages. These little things are great for the odd cabin in the woods that may or may not be inhabited by children-eating witches. Basically, throw them in the background of a scenario using the Von Drakk level box, or whatever your homebrew setting is doing in the dark forrest. The good news here is that the rounded surface of the roof means that you only have one place you really need to mod. The bad news is that the rounded roof means you’ll need a lot of clean up. My solution was to make more flowers on the roof with green stuff. I tried doing this in two ways: 1) a press mold based off other flowers on the roof, and 2) sculpting flowers from scratch. Here, the flower on the bottom right is scratch while the others are molded. 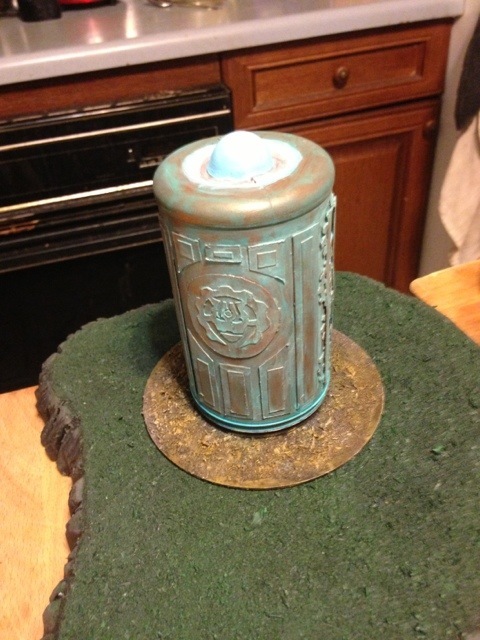 Additionally, I put flowers on the top where there was a molding divot. I then decided to prime in green, supposedly to save time on painting. This turned out not to be the case. The finished cottage will work reasonably well on most forrest boards. This was more or less a proof of concept here. I’ll probably sculpt all the flowers in subsequent attempts because the press molds never quite come out smooth enough. Additionally, these little cottages don’t have quite the range of reapplication or mod-ability that the Series 1 houses do, but they will make a cute edition to most any chibi-themed game board. Ever noticed that there’s all these great arctic themed things for Super Dungeon Explore? You’ve got the Deeproot Druid and Angry Bear in the base game, half the Mistmourn Coast box is ice themed (including the Salt mini boss), there’s the Deeproot Wolf Rider, and maybe even the Tusk Raider (if you were lucky enough to snag one). With all this ice, there clearly needs to be more nordic love for components and terrain. Luckily, here’s a tutorial to help a bit. Start with an Animal Jam Series 2 Igloo (available on Amazon here or in the toy bin at your local Cracker Barrel). These little guys have the same problems as the houses I talked about here. They have signage on the front and back that needs to be addressed. I decided the uniformity of the pattern was a bit too much for my personal chibi aesthetic, and so I then bulked out a few bricks with green stuff. I also used green stuff to remove cover the small logo on the front. I then painted the igloo up with a series of blues, starting with a blue primer and moving my way up. My rational for the blues can be seen here. I have an ice-themed game board that is mostly layers of whites. A white igloo would too easily get lost on the table. A quick way to make chibi houses for all your gaming needs is to pick up Animal Jam Adopt a Pet Houses (also available in six packs here). These little houses come with small critters and key codes for an online game that I’ve never bothered to investigate. If you are child adjacent you might find a use for the minifigs. This tutorial is using the Series 1 pet houses. Later series look like igloos, huts and cupcakes. I’ll show how to work with other varieties later one, but for now we’ll start with the houses. These houses are 2″ x 2″ bits of chibi goodness, but they do have some annoying branding you might want to mod. For example, there’s this lady bug on the front of the house. There’s also the logo on the back, which you will certainly want to remedy. For the front, you can cover it over with a bit of green stuff or a random piece of weaponry; but usually I put another window. I’ve made an impression of one of the side windows using instamold. I then pressed out a few copies out of fimo clay. Who doesn’t need a little bit more light in their house? For the back, a simple solution is to make a large chimney out of foamcore. I cover the foam core with a thick coat of hot glue to help with structural integrity and protect it against the spray primers I tend to use. Another possibility is to hit the logo with a dremel and grind the back into something resembling logs. Or, you could just stick two windows on the back (here with a makeshift overhang to help keep the rain from running in the windows). Other additions here are stove pipes of various sizes and dormers for additional space upstairs. Prime them, paint them up, and they’re good to go as terrain for your next chibi D&D game or for blocking line of sight in a chibi wargame. Looky here. My Cavern Tile kickstarter showed up—two sets (enough for all the stretch goals), along with a side (literally, on the right side) of ten corridor pieces. The quality of these pieces is very nice, given the price. They seem a little less robust than the dungeon tiles. The bottom of each tile is concave, and hence there is less plastic to the bottom of each piece. As a result, a few of the thin tiles have a bit of warp to them. 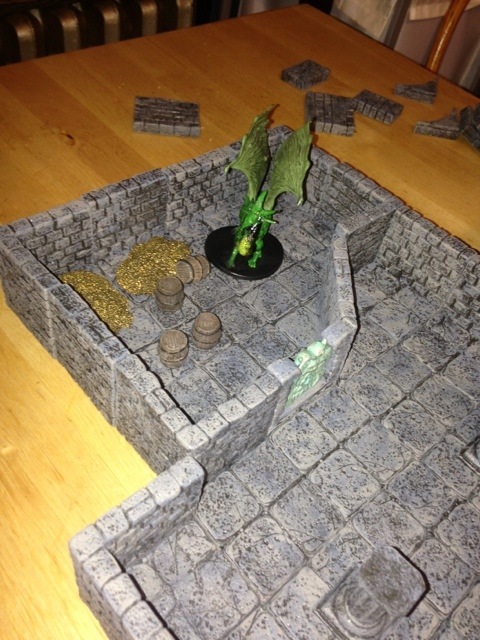 Granted, they are cavern tiles; and as such, I’m not to worried about things being a little more warpy than with the dungeon tiles. 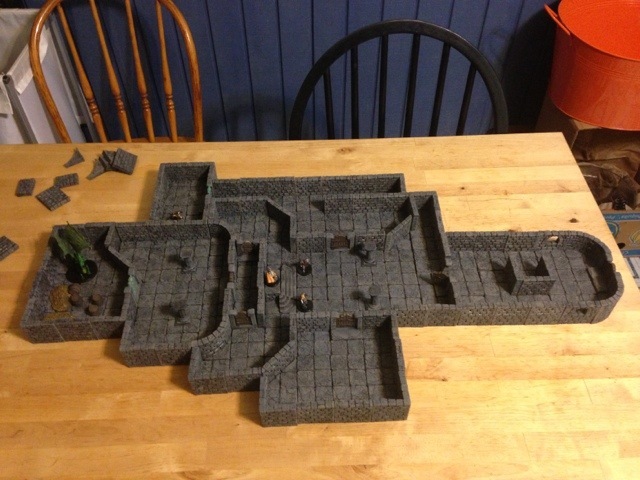 Still, this will be something to watch out for if Dwarven Forge runs another kickstarter in the future (which will clearly be just a ploy to take more of my money). Hopefully I’ll have time to paint these guys up before the end of the year. I’m not sure exactly how to paint some of the fiddly bits. Additionally, the watery areas bring up the question of how to get a water effect on this plastic. Stay tuned. 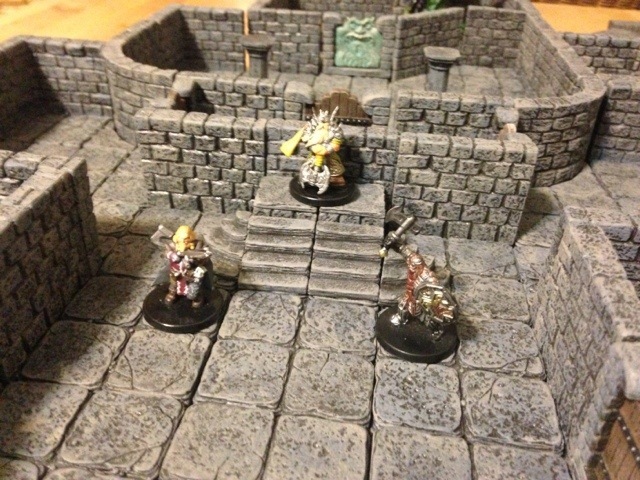 After a weekend of pretty heavy painting, my Dwarven Forge tiles are painted. And here is the joyous dragon with his shiny (the real power behind the dwarven throne). And here you can see the dwarven king at court with two of his loyal man-at-arms (completely unaware that there king’s mind is being held in the dragon’s trawl!). So the other night I played a few games of X-Wings. I haven’t done so for a while since my usual partner has basically rage quit the game. In any case, I discovered something very important while playing: it can be slightly boring just to try and kill all your opponent’s ships. This shouldn’t surprise me—I generally play scenarios in Warmahordes for just this reason. So I’ve decided to play more of the X-Wing scenarios. This however involves SPACE TERRAIN. Using teh Googles I discovered this great little video on making asteroids for Battlefleet Gothic (the Cadillac of space wargames). I’m still working on getting the right melty bits on my pink foam, but I should have some picks up in a few days. 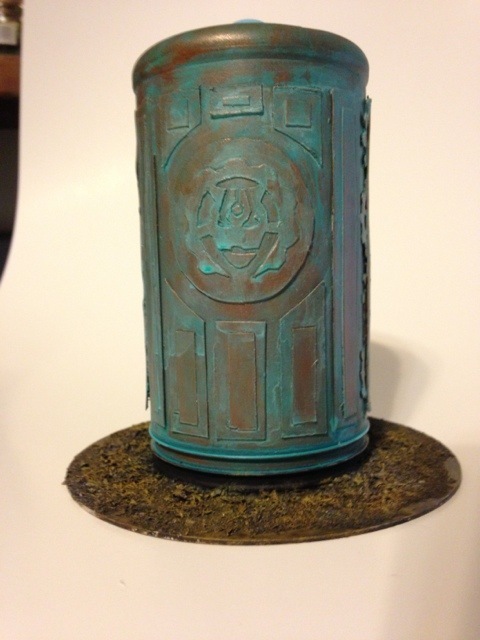 Terrain for the Convergence book release.